Umpqua Bank tries something decidedly different for the financial services category with "The Seed and the Moon," a visually stunning animated short by CAA Marketing and Nexus director Kibwe Tavares. The three-minute film is a parable about growth and humanity. It opens when a lone tree in a forbidding, Blade Runner-esque metropolis is torn apart by an earth-moving machine. One of its seeds manages to take root in the cracks of an alley. Nurtured by moonbeams, the little green guy grows and grows, ultimately shooting toward the clouds and utterly transforming the harsh urban sprawl into a sun-splashed, verdant wonderland. Jónsi of Icelandic post-rock band Sigur Rós provides the enigmatic and uplifting ambient soundtrack, and lines from the poem "Good Timber" by Douglas Malloch—labeled "The Lumberjack Poet" in the early 20th century—form the narrative: "The tree that never had to fight/For sun and sky and air and light/But stood out in the open plain/And always got its share of rain/Never became a forest king/But lived and died a scrubby thing." Tavares says he "wanted to create a beautifully simple, magical narrative that would hit the key themes of hope, empowerment and triumph, showing how something relatively ordinary, that we take for granted, can transform into something spectacular." The film and podcast, plus a traveling art installation on financial themes called "Exhibit: Growth," are elements of Umpqua's overarching "Made to Grow" initiative, designed to "kickstart conversations about money," Umpqua's evp of communications, Eve Callahan, tells Adweek. "Through creative and artistic content and experience, our goal is to help people make decisions about money that help them achieve their full potential," Callahan says. This holistic, humanist approach is in keeping with Umpqua's progressive image. The Portland, Ore.-based institution prides itself on customer service and brags about hosting movie nights, yoga classes and other community-building events at its 400-plus West Coast locations. 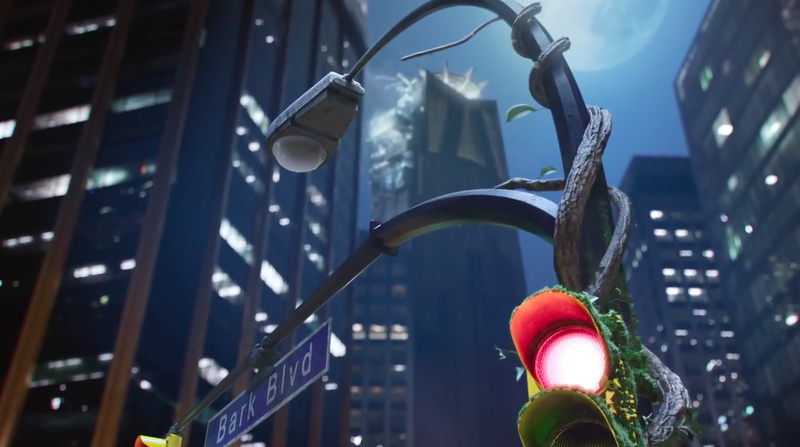 That said, the images of the vegetation bursting through the sidewalks and essentially taking over the city—which Callahan says have a joyous, "fairy tale" quality—also seem kind of apocalyptic. These mutant plants will kill us all! Grab a weed-whacker and defend humanity! The film also lacks a human focus—actual people to root for, whose struggles viewers can identify with. Contrast Umpqua's ad with Grey London's innovative elevator spot a few months back for HSBC, which put our hero front and center. "Our goal is to inspire and empower people to take action," says Callahan. "We want people to realize that money and banking don't have to be intimidating, and that they can start easing the confusion and stress associated with these topics right now by having a conversation." That's a noble notion, and, to its credit, the campaign provides a welcome break from ads that drone on about free checking and convenient online banking. Sure, Umpqua's tactics could prove polarizing, but that's the risk you take going out on a limb. Spot: "The Seed & The Moon"